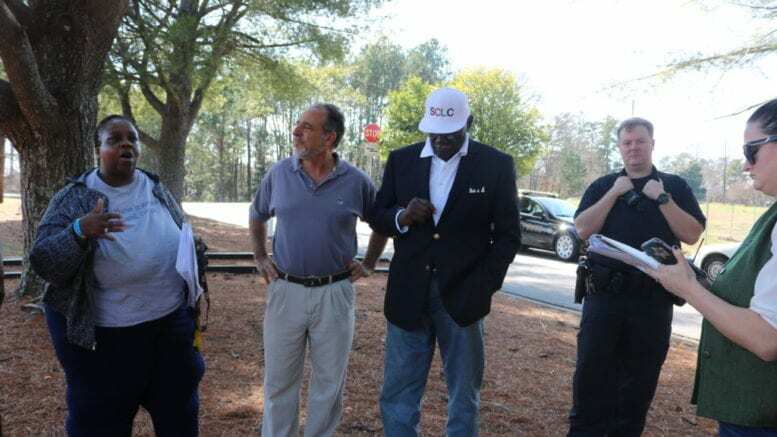 The Cobb County chapter of the Southern Christian Leadership Conference (SCLC), along with the We Thrive in Riverside Renters Association, held a press conference with residents who have complained about conditions in three apartment complexes owned by the same Ontario-based investment group. The complexes, which were recently issued a list of alleged code violations, are Kingsley Village, Hunters Grove, and Parkview Apartments. The long list of citations included 26 alleged violations of the litter ordinance, 24 violations of “use limit — outside storage,” 22 counts of “non-compliance vehicle,” and an assortment of alleged violations involving the windows, gutters and shutters on the buildings. Kerrison Chin, the Asset Manager of the investment group that owns the complexes was the individual named in the citations. During the press conference, Monica Delancy, founder of the We Thrive in Riverside Renters Association, said that the magistrate court hearings on the violations had been postponed several times. The first hearing was set for December, the second for January 31, and then the hearing was delayed again, until March 7, after the owners retained a lawyer. Delancy also said that many resident complaints were of conditions inside the apartments. The code violations were only for conditions outside the apartments, which is the jurisdiction for the county’s code enforcement department. Dr. Ben Williams, the president of the Cobb County chapter of SCLC, said that he also was a resident of the Mableton area, and lived in a nice house. “But I still have empathy for those who do not share the same advantages that I have, and that’s why I’m here,” he said. Well, first of all I appreciate the opportunity to showcase the other side of the story. And that is that these claims are preposterous. Let me explain why. First of all I want you to understand the facts. The facts always override the fiction, and the public deserves to know the truth. So the truth is that we (the owners) have been negotiating with Cobb County enforcement officers (and) Cobb County Police Department for months. And we have drafted and we have agreed to a voluntary abatement program. It has been authorized and it was signed off on literally yesterday. And prior to that, we have taken measures to have the trash removed from the property, and also the additional trash, which, by the way, is caused by troublesome tenants, not responsible residents, and illegal dumpers. So we have been blitzed with that, and we have taken measures to address that. In addition, when these citations took place … on these properties, all of those managers have been replaced. None of them are working on the property. The three managers who are there now are doing a great job in turning things around. And it’s not fair for them to be penalized mercilessly when they were not the problem. They are part of the solution as we are as well. And the Cobb County attorney, and the police are extremely pleased with the improvements that we’ve made, and they’re very enthused to work with us. And I did mention that it was a voluntary abatement plan. So we are working with them to turn things around. And the responsible residents appreciate it. In fact, the responsible residents over at Kingsley Village were outraged today, And they showered their support to the community manager … saying how outraged they were at these claims. And it turns out that these claims have been instigated by someone who is basically blaming the community manager there at Kingsley Village for a situation which was caused by herself for being delinquent in the rent. And so she’s creating other issues to cause this thing. And during her hearing she lost her case. So the reality is that what they are doing is creating unfair and fictionalized chaos. Because we’re doing what we can to do things and turn things around. And the responsible residents deserve that. But troublesome tenants should be held to be accountable and responsible just like everyone else. And we are very pleased with the progress we’ve made today, and you take a look at these properties, they look amazingly better than they ever did before. Those are the facts. So let’s move forward and let’s transform these communities. 1 Comment on "Cobb SCLC supports Riverside Parkway renters in complaints"
It will be better to gut the entire Riverside Corridor apartments and start over with higher end apartment housing and nice shops. Something to complement the growing area and close proximity to Six Flags.